Grabbing drinks can be a powerful tool for collaboration. This has been written about fairly recently by quite a few people, including Doctrine Man, John Silk, and others (I even jumped into the ring discussing the “Cigars, Scotch, & Strategy” group I started in DC). The same dynamic still rings true even if it’s just a one-on-one gathering to catch up. 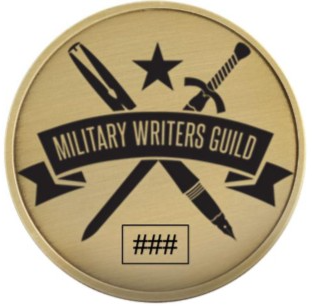 A little over a year ago I was bouncing around the idea of trying to amplify the work of the growing group of military writers I was continually running into (and collaborating with) online. Twitter is a phenomenal tool for colliding with people of similar interests — especially if they’re prolific writers/tweeters — and have quick conversations, but much harder to create a shared space among strangers. Enter a social call with Ori Brafman at the Willard Hotel. I’ve known Ori for years — since his work with the Army’s Training and Doctrine Command following the publication of his book Starfish and the Spider. If you know Ori, you know there were about a thousand ideas he and I threw back and forth…but the one that jumped out at me was a group he was forming called the Silicon Guild. The intent of that group, started by Ori and Peter Sims, another prolific business-world idea man, was to gather those like-minded writers to amplify their work on trends in business and society. The next day I went in search of said guild and found this phenomenal post about the power of guild-like organizations in a disaggregated world (a world like that we are continually seeing created by the internet). Empowered by this idea, I shot a note to a handful of the most solid, energetic writers I knew in the military space (ultimately becoming the founding members)…paying close attention to cover the majority of the military services and even the defense industrial base. We batted around a few ideas, created a logo, developed a website, and wrote a charter. We had a guild. I’ll let our members speak for themselves. Below is a wonderful list of all the hard work and creative spirit expended by Guild members over the last year. From peer-reviewed journals to short stories and books, our members have helped define the military and veteran writing space in 2015. A year after its founding, the Guild continues to ask, “Now what?” However, unlike last year when we started with a blank screen, we now have both lessons learned and a way forward. 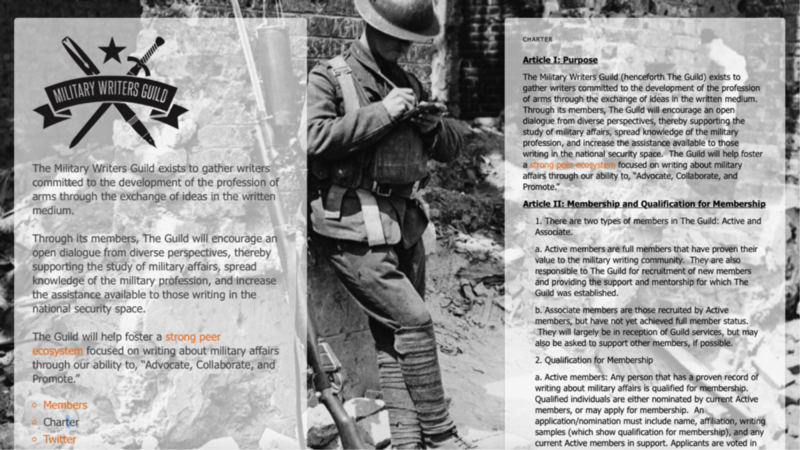 With hundreds of members in the Military Writers Guild, a flat but effective governance structure, and engaged members advocating, collaborating, and promoting each other’s work, the Guild is well postured for the New Year. We hope you’ll read our members’ work, be inspired to write yourself, and join us in our endeavors to develop the profession of arms and veteran space through the exchange of ideas in the written medium.